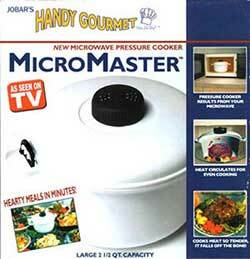 The NEW MicroMaster Pressure Cooker is just what you need to make a hearty meal in minutes. Get convection oven results from your microwave. The heat circulates the cooker for even cooking. The cooker cooks so good that the meat is so tender, it will fall off the bone!